It was day three in Branson and I continued to enjoy this Missouri city with my friends Marsha, Brittany, and Amanda. 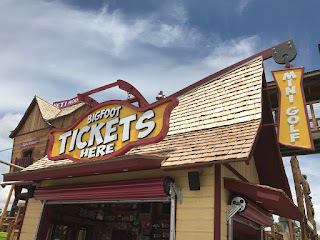 Our first stop for the day was at an attraction new to the city this year, Bigfoot on the Strip. 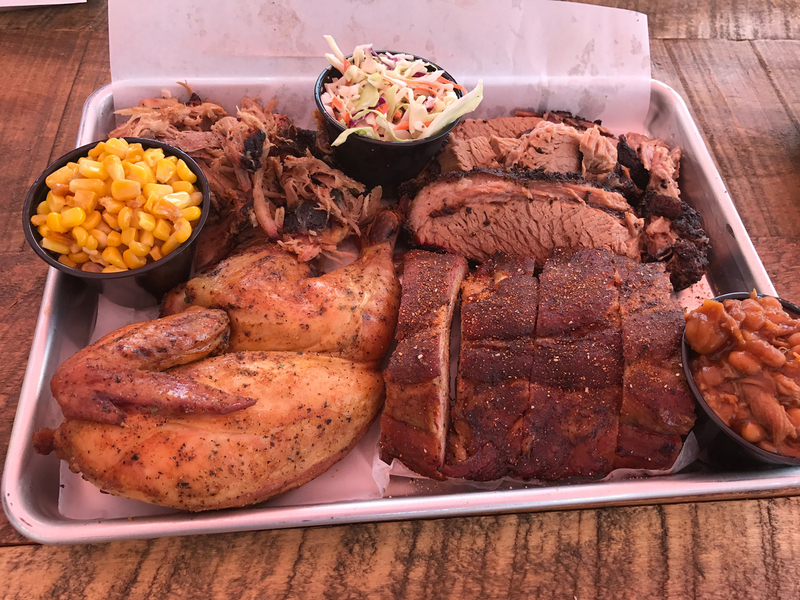 We thought it would be a quick stop, but we soon realized there was so much to do (and eat) that it was fun for the day. 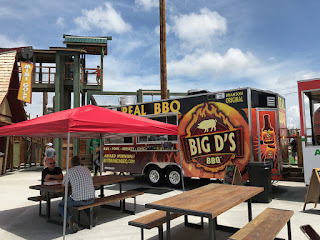 Bigfoot, a joint adventure by three locals, who also happen to be in the food business (more below), is an adventure park with unique activities to keep kids and adults occupied and having fun. Brittany and Amanda took off for the maze immediately. It was nothing like you’d find at chuck E Cheese. This one required a lot of climbing and crawling, with stops in a tall water tower and the opportunity to jump onto a trampoline-like pit. 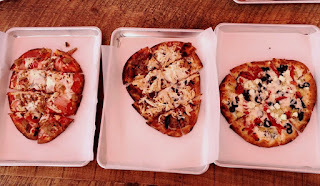 Before checking out anything else, we stopped for lunch at Bigfoot’s food trucks, Big Ds BBQ and Parlor Pizza Wood Fired Pizza. 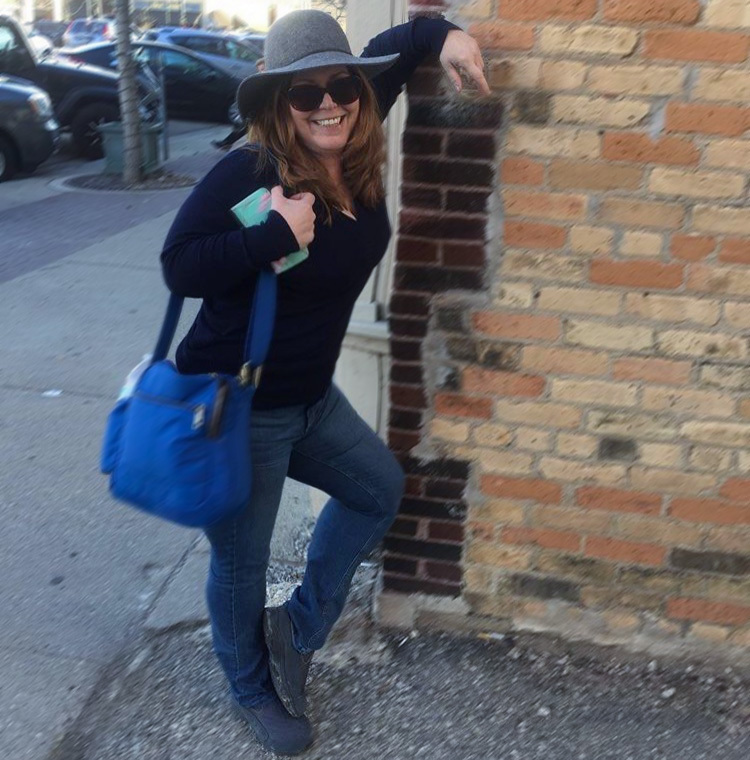 It was a unique and delicious alternative to a snack bar. 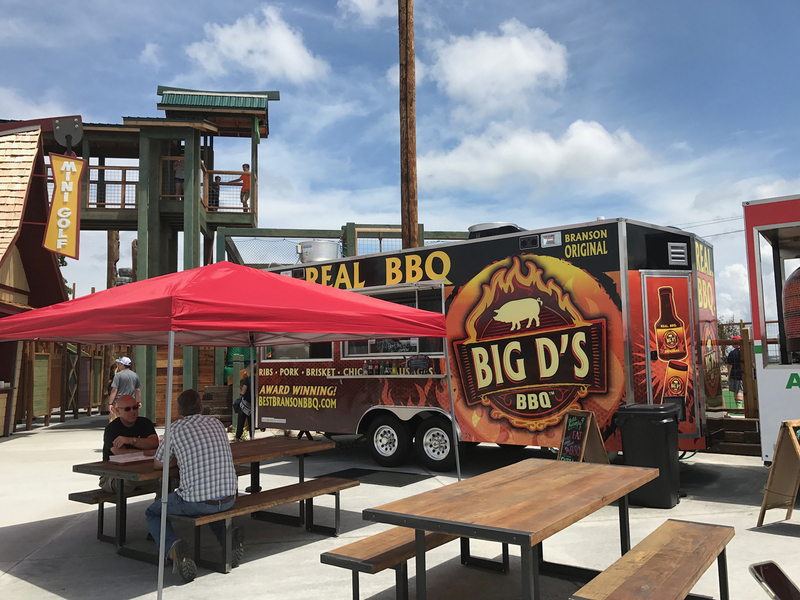 Owner Darrell “Big D” Henley showed us around the state-of-the-art trucks, where they can smoke their own meats and wood-fire pizzas. Our “samples” turned into a magnificent buffet and I couldn’t even tell you what we liked best – it was all mouth-watering. 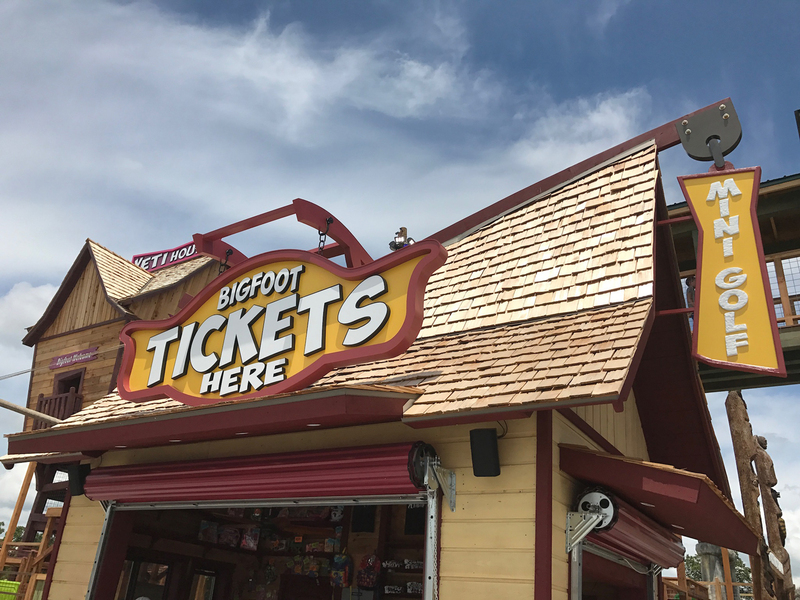 After lunch, Brittany and Amanda hit the main attraction, the Bigfoot Action Tower, which contains two rides in one 200’ high construction. 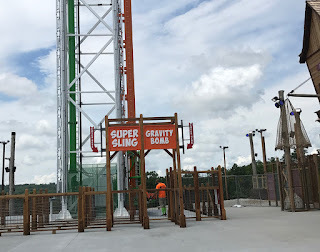 The Gravity Bomb™ is a freefall that uses a magnetic braking system to bring the riders to a smooth, but abrupt, stop after they “fall” down from the top. 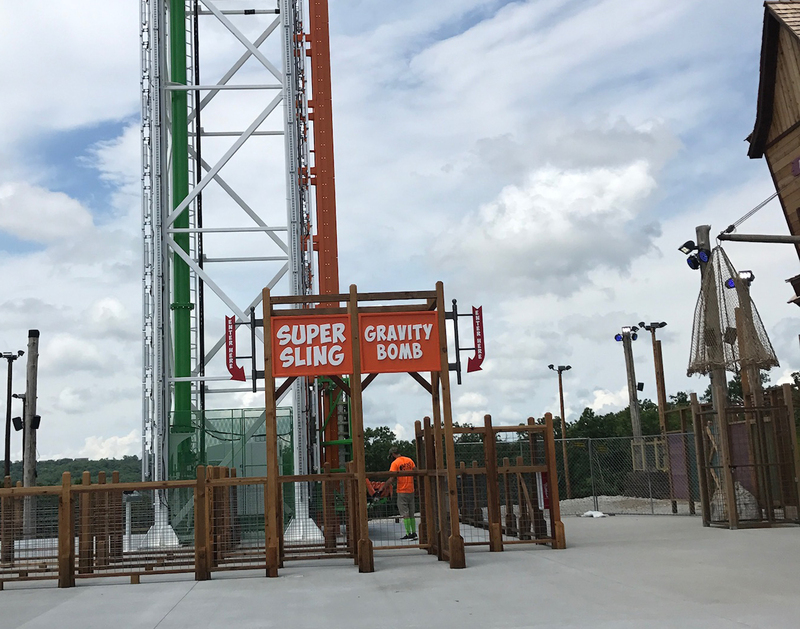 The Super Sling™ is more of an actual ride, as two people sit together and flip slingshot like into the air and back down. After the golf, we went inside to the arcade for the 8D Action Ride. 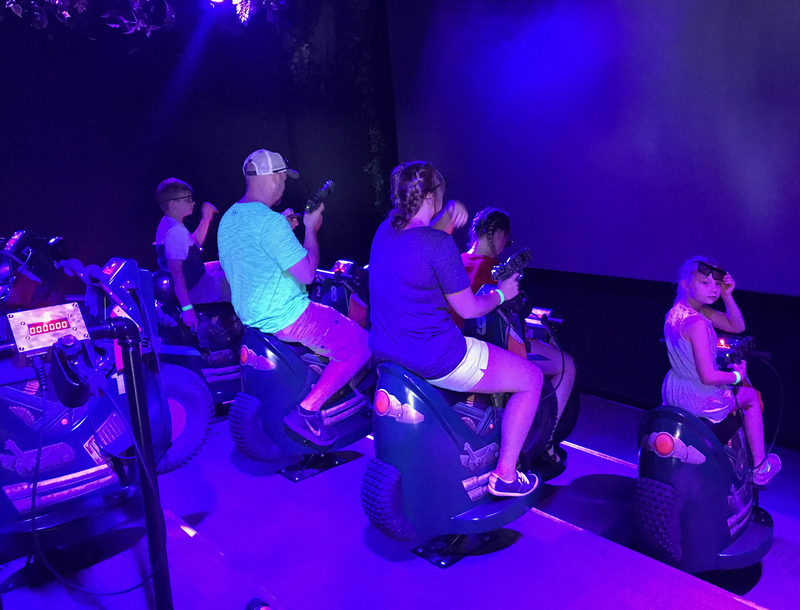 This goes way beyond any 3 or 4D experience I’ve had, as you get 3D glasses and laser guns, while on an actual mini bike that jerks back and forth with sound effects. You can buy individual tickets to Big Foot on the Strip, but I recommend going for the all-inclusive package if you want to spend the day. 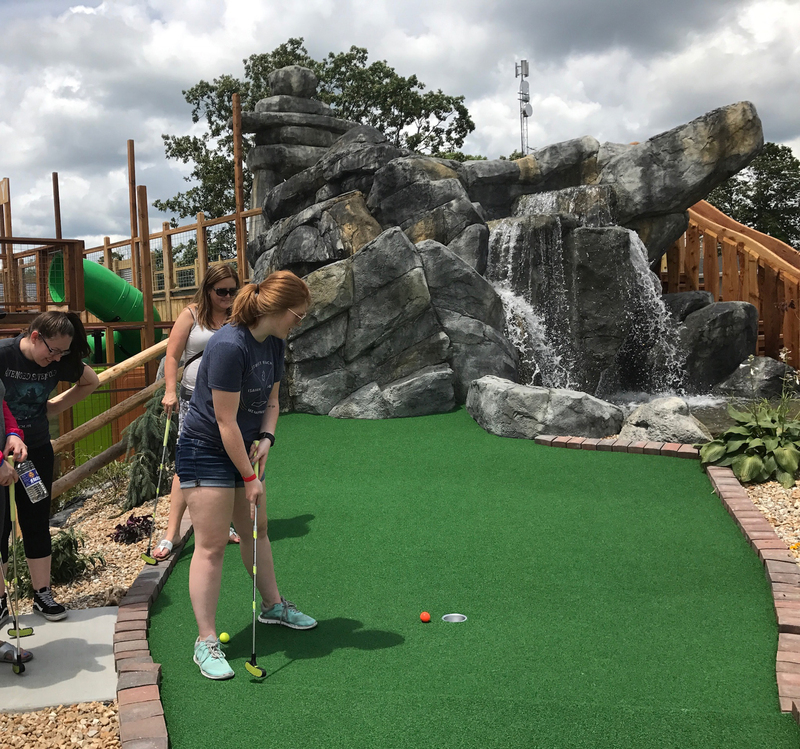 It was hard to get them off the Action Tower, but Marsha and I were ready for some mini-golf and Bigfoot has a fun course that even takes you through a muraled tunnel. 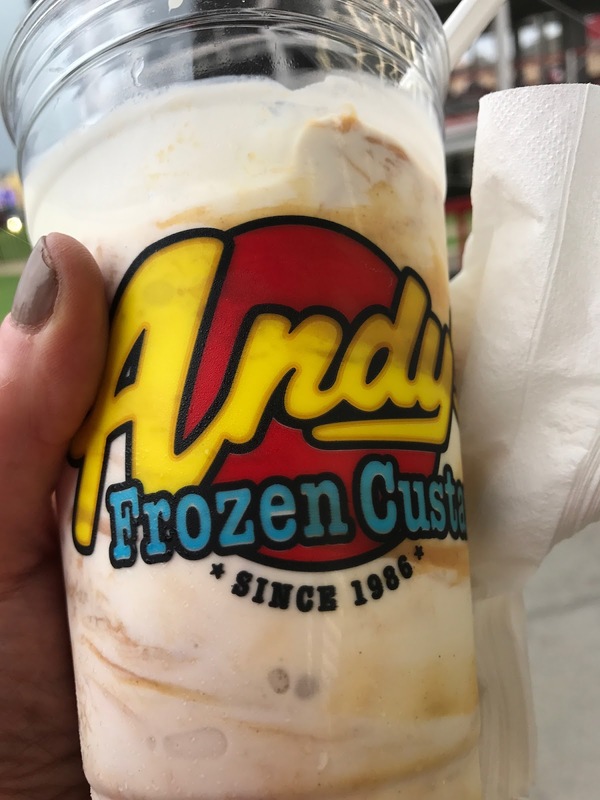 We couldn’t help but notice an Andy’s Frozen Custard next door as we got in the car to leave and stopped for some afternoon treats. for a bit to shower and change. 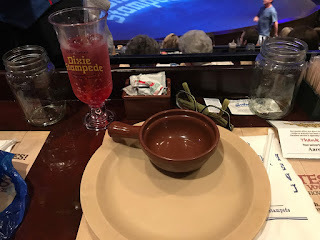 We had plans to go to the Dolly Parton’s Dixie Stampede Show. 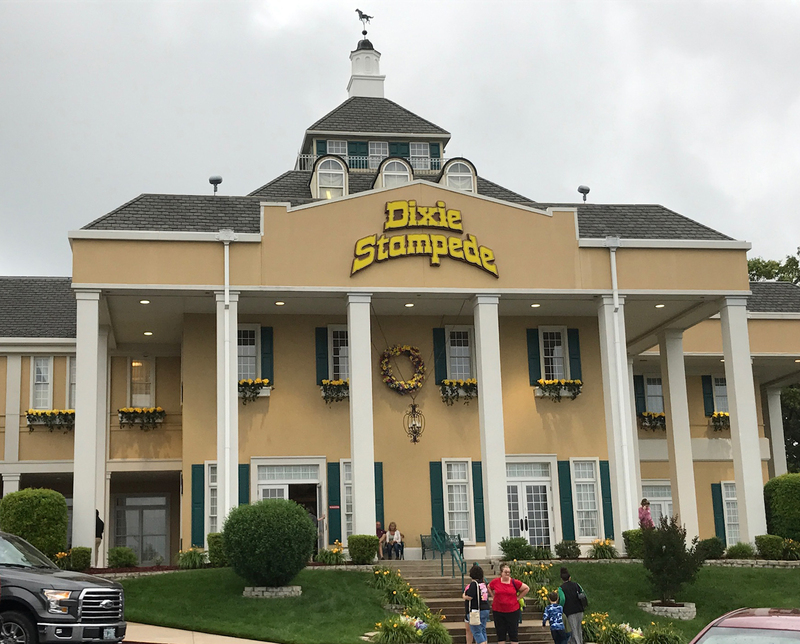 Marsha had been to the show in Pigeon Forge, Tennessee, but the rest of us weren’t sure what to expect when we pulled up to what looked like a Southern mansion. 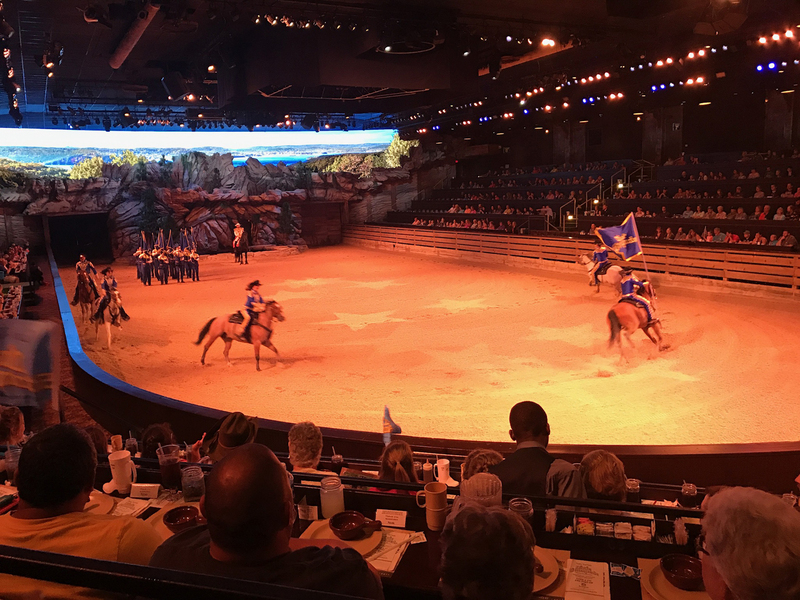 After we picked up our tickets we had time to walk through the stables and see the horses at this Branson, Missouri location. They are switched out each show so they don’t get worn out and they were all pretty friendly. 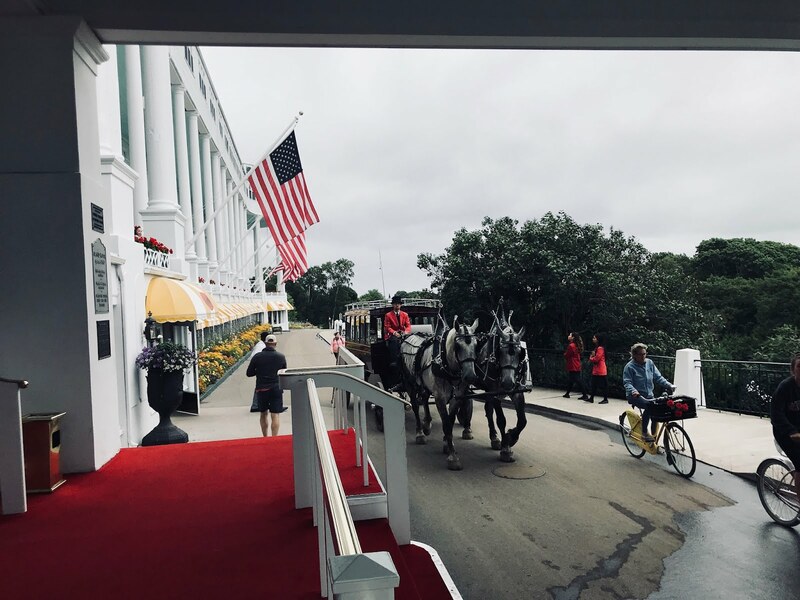 We walked through the gift shop and into the carriage room where there is a bar (non-alcoholic drinks only) and a pre-show. A bit crowded it was a bit crowded, but we were only in there for a short while before they called us into the main arena. 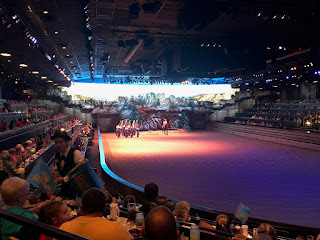 We all sat around a large circular sand-filled area for the show, which included a little of everything, with changing backgrounds, horses, riders, cowboys, dancers, wagons, and more. 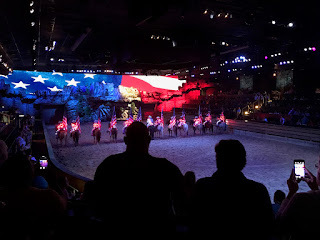 There was plenty of special effects, including jumping through fire, and stunt riders. It was a lot of fun to watch. There was a wonderful and patriotic finale. Our place setting was complete, but without any type of utensils. You eat everything at this show with your hands, but it’s not quite as messy as it sounds. Dinner was quite good, consisting of a small rotisserie chicken, barbecued pork loin, creamy vegetable soup (in a bowl with a handle to pick up), corn on the cob, a baked potato, a biscuit, and an apple turnover for dessert. After the show, we went back to the Radisson Hotel Branson for a good night sleep. We had one full day left in Branson and it was going to end with a late night out.